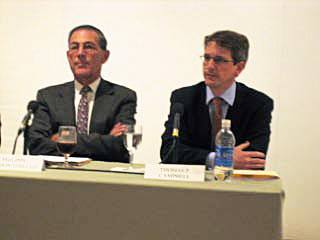 Robin Pogrebin‘s damning NY Times report about the “tensions” and “challenged morale” among staffers at the Metropolitan Museum has emboldened me to say what I’ve been thinking for a long time about Tom Campbell‘s stewardship: Sadly, the misgivings that I expressed more than eight years ago, when the respected tapestry curator was named to succeed the revered Philippe de Montebello as director and CEO of the Metropolitan Museum, appear to have been prescient. What the museum didn’t need is another wonkish manager. What the museum needs is someone who can come in, as Philippe has done, and draw on the strengths of the staff and help encourage and bring forth the ideas and the creativity and the interaction that we need to maintain the dynamic acquisition program and exhibition program, to enrich the visitor experience in our permanent galleries. It’s a question of vision and human chemistry. You’ll have to judge me by my performance in four or five years’ time. We’ve now had eight years to judge him, and I’m convinced now of what I feared then. He lacks several essential traits of a successful leader of a major museum, including two that are conspicuously absent whenever I hear him speak at press previews—a commanding presence that inspires confidence, and a dynamic, fluent speaking style. More damaging has been his embrace of new initiatives and capital projects without securing adequate funds to sustain them. The fallout from this—cuts in staff and exhibitions—go to the core of the museum’s mission. In my February 2010 Wall Street Journal profile of Campbell, I had approvingly noted that he evinced “a strong grasp of the intricacies of the job and his institution.” What I refrained from describing was how, a year into his job, he was still stumbling over sentences, repeatedly doubling back to rephrase what he was trying to convey during our far-ranging conversation. A museum director needs to be a great communicator. But Campbell speaks from podiums in monotones, dutifully reading from prepared scripts and periodically flubbing names, as he did at the Met’s most recent press preview on Monday, where he repeatedly referred to the 17th-century Dutch printmaker Hercules Segers as “See-ghers” (rather than “Say-ghers,” as pronounced by curator Nadine Orenstein in her lively remarks after Campbell’s introduction, excerpted in my CultureGrrl Video, below). Much more serious than Campbell’s lackluster oratorical performances are his deficiencies in managerial skills and fundraising prowess, as evidenced by his track record. A chief preoccupation of the Met’s President Daniel Weiss, a former Haverford College head with an MBA (not to mention a PhD in art history), is to put the museum on a more solid financial footing. Weiss, who assumed his post in July 2015 (not “last year,” as Robin reported) has said that the cutbacks would not be felt by the public. But how can that be, when so many key staffers have left the building and (according to Robin’s report) exhibitions will be reduced by about one-third? Right before assuming the Met directorship, Campbell confessed to The Economist that he felt like a “kid in a candy store.” Regrettably, that giddy simile has been proven to be right for the wrong reasons.